This is a post I hoped I would never write. 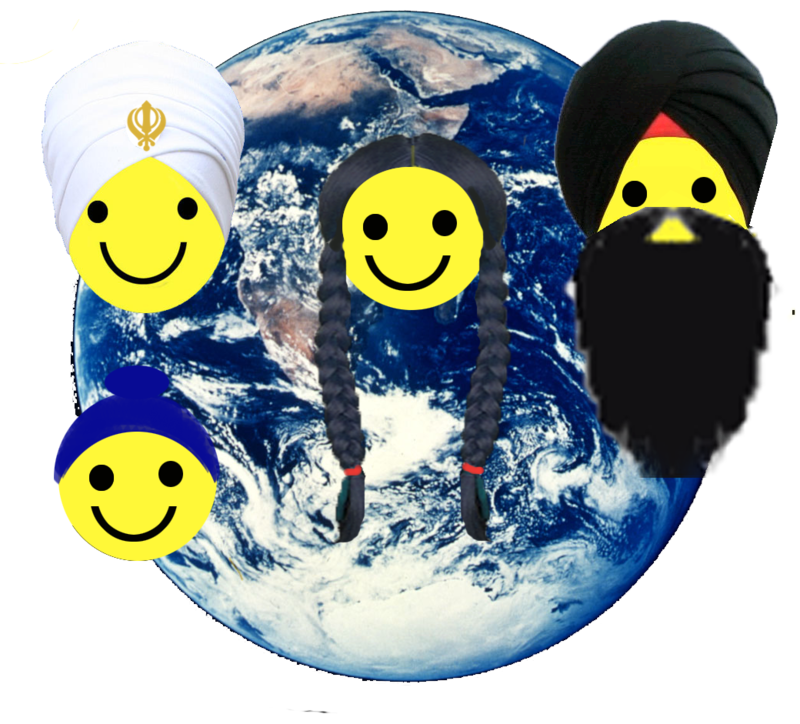 As you, my readers, know, I practice the virtue of chardi kala, translated in many different ways, but all having the meaning of eternal optimism and never giving up. I am still practicing, but it is hard. No doubt by now you have heard about the massive oil spill by British Petroleum in the Gulf of Mexico in the Caribbean Sea, truly a paradise on earth. Or at least it was until 20 April 2010. 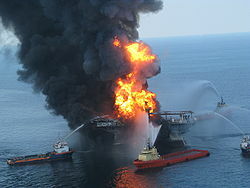 On that day the Deepwater Horizon oil rig - owned and run by British Petroleum - exploded, caught fire and began gushing massive amounts of crude oil into the pristine waters around it. Eleven were killed and 17 injured. That was tragic, but it is just the beginning. 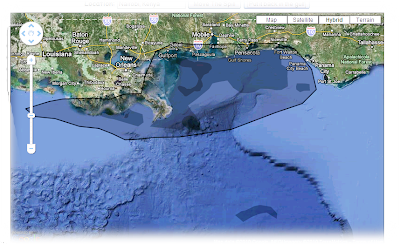 The amount of oil gushing into the Gulf is estimated at somewhere between 1,475,000 and 4,200,000 gallons per day ( 5,583,432 and 15,828,729 liters/day). No one knows how much oil is in this well, how long it can keep gushing. Years or decades, if it is not somehow stopped. So far nothing has worked. In fact, efforts have actually made it worse. Here's a nice little widget to help you calculate. If I happened to miss your locale, go to Ifitwasmyhome to move the spill to wherever you live. Perhaps you'd like to see it as it happens. 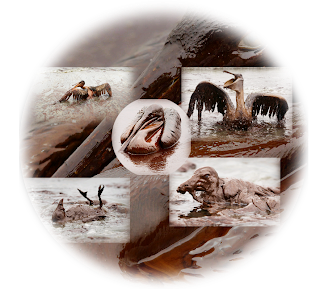 If that's not enough to bring it home to you, here are a few oil-soaked pelicans. I find this horribly painful to look at. Gas Leak 3000 Times Worse Than Oil. And, by the way, with our current technology we have no way to cap or contain the methane. I guess that's not enough bad news. It is now hurricane season. (For those of you in Asia, those are typhoons.) There will be hurricanes. In fact, the first one is blowing right now. Hurricane Alex did not move close to the spill, but there will be another hurricane and another and another. The next thing to consider is the ocean currents. The Gulf Stream is an ocean river that runs from the Caribbean to Europe. Eventually this oil and methane and all their problems will reach Europe. They will also travel up the Atlantic coast of North America all the way to Canada and all points north. No one knows how much of the ocean will die. Certainly a large part of the Caribbean Sea will and it will take decades to recover. In the meantime the many people who make their livings along the Gulf, either fishing or in the tourist trade, have lost their means of livelihood. It is even possible that the land they live on will become uninhabitable. Bobby Jindal, the governor of Louisiana has been alerted that a mass evacuation may become necessary, if a hurricane again hits the state. 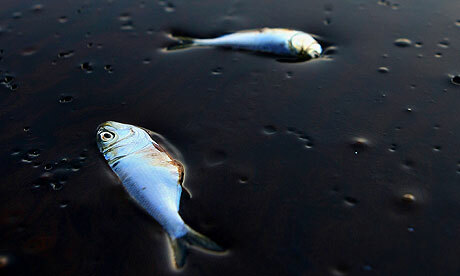 It is likely that once gone, the people will not be allowed to return due to the toxic oil and gas along the coast. The earth is one big ecosystem, based primarily on our oceans. If a large part of one ocean dies, that will have a cascade effect on the rest of the planet. How far could this go? Worst case scenario: Bye-bye. "Not with a bang, but a whimper." If you don't recognise those lines, they are the conclusion of T. S Eliot's poem, The Hollow Men. To hear the whimper go to Power Without Petroleum and listen hard at 0:25. Best case scenario: the southern coast of the United States becomes uninhabitable for a period of time and much of the sea life in the Gulf of Mexico dies, with devastating consequences to the people who now live there. As it is impossible that there be no hurricanes in the season, we can be sure that the winds will carry the oil throughout the region, damaging all it touches. That damage cannot be estimated at this time, except to say it will be extensive. 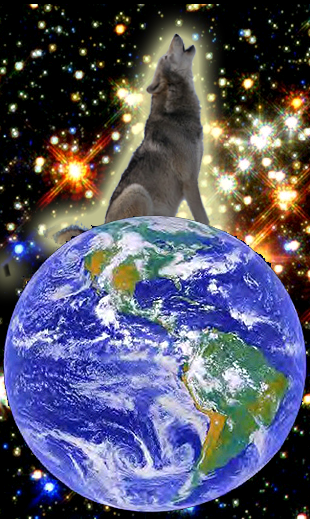 As long as I can remember, the scientists have been screaming "Wolf!" 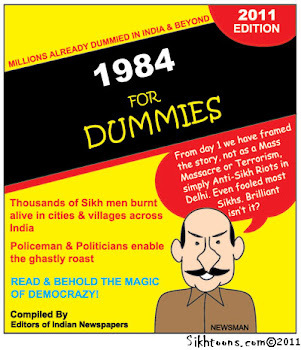 alerting us to this or that which they claim is going to wipe us out. 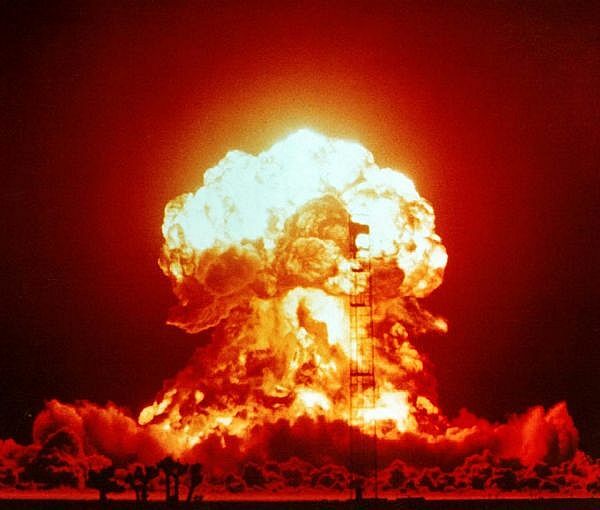 As I child I grew up with "nuclear annihilation." That was the biggie. There have been others: the hole in the ozone layer, swine flu (twice), bird flu, global climate change and I'm sure others that I have forgotten. And it seems, life causes cancer. There is truth in all these scientific assertions, but there was also something we could do to stop or at least alleviate the disaster. As I see it, this is different because we are helpless to do anything except pray. Of course, I am not a scientist, and the only way I see out of this is divine intervention. Even if the spill can somehow be stopped, we can do nothing about the methane. This is the time more than ever before that we need to dig deep within ourselves and find the high spirits, the chardi kala, that is a part of us. It takes courage to look tragedy in the face and carry on without panic or depression. And what caused all this? Of course it was British Petroleum cutting corners on safety to save money and increase profit. It was Pres. Clinton who authorised the deep sea drilling. It was Pres. George W. Bush who so favoured the oil interests and permitted a lack of oversight to allow BP not to follow the safety measures. It was Pres. Obama who did not immediately step in to correct this corruption from the previous administration. But it was also all of us who are dependent on petroleum, who refuse to cut back on our usage, we who demand more and more. In the end, if we had not demanded this oil, if we had lost our lust it, BP wouldn't have been able to make the profit that drove them to build this rickety structure upon the rickety structure of our economy. So what now? We have learned why greed is such an evil thing. Whither our good, green beautiful earth? 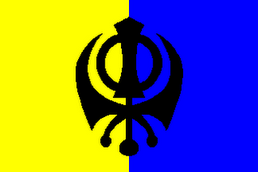 Remain in chardi kala, my dear brothers and sisters! Those images say it all. 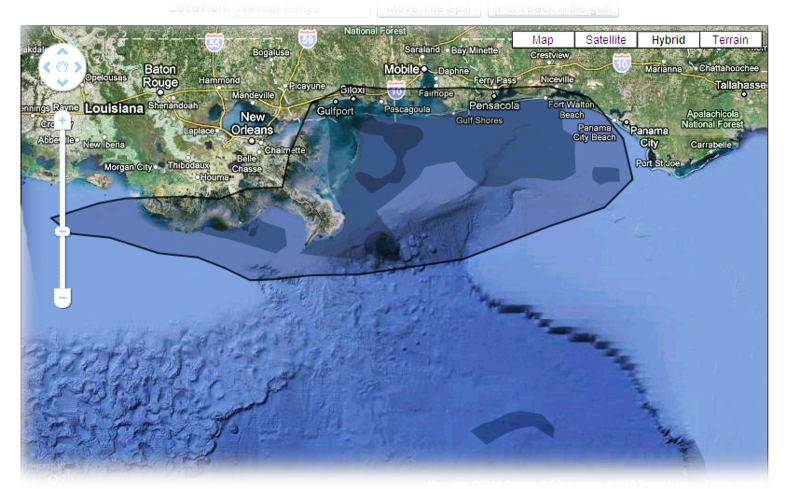 I will admit that I really didn't fully understand the danger of off-shore drilling until now. Now I understand. Noe others are beginning to understand. If only we're not too late. I just came across this article. Thought you might find it interesting too. Are they really serious in trying to contain the danger? I have found that the American government is primarily an huge, overgrown, unbridled Ego. I believe American law prevents this sort of aid from other countries. And, Russia, Russia, well, really! There is a good reason why every religion I know (except Satanism) considers pride a big no-no. And as I remarked to a friend, "contained" is not the same as "stopped." For example, that stroke has plenty much contained me, but I am most certainly not stopped. I think we have not even begun to see the repercussion of this tragic event. The companies with be in legal litigation for decades trying to shrug responsibility meanwhile he creatures affected may never recover. What get's me is that the real reason people are upset is because they can no longer exploit (fish kill devour) sea creatures who have now been killed off by other means... It's like they don't get it. The entire scenario is purely selfish (especially when it comes to shellfish). Does anyone really comprehend the Worst Case Scenario of this? If that methane kills off enough of the ocean, none of us can survive. And the government of the USA is trying very hard to keep real information from the public, up to the point of making the taking of photographs a felony. http://fubarandgrill.org/node/97 What is that all about? I also disapprove of fishing the Gulf (or anywhere else) for the purpose of catching seafood to eat. Being realistic (for once), however, I do feel pity for those who depend on the income from this to feed their families.